In which I complain about my commute | Random moosages as I see fit. Yesterday, I had to drive out to a client site for a meeting. I knew I would be on client sites a lot when THEM hired me. They told me so. I didn’t think it would be a big deal. Then I realized what going out to a client site could mean. It could mean…DRIVING TO THOUSAND OAKS DURING MORNING RUSH HOUR. Here’s some background: I am based out of THEM’s Cerritos office. Cerritos is on the far eastern side of LA county. Thousand Oaks is right outside the far western side of LA county. LA county is big. And in between Cerritos and Thousand Oaks is the dreaded Downtown LA. 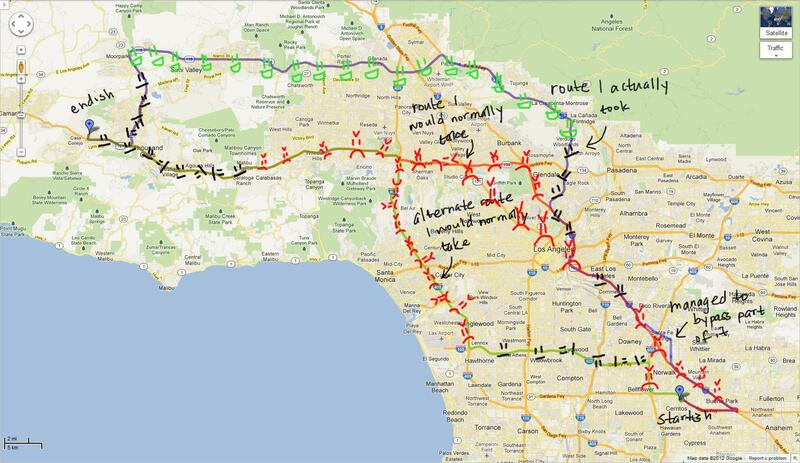 No commute that has to go through all of LA county AND ALSO Downtown LA can go well. Especially during rush hour. And that’s how it’s been. The first time I had to go out to the client site, a few of my coworkers and I carpooled so we could take advantage of the HOV lane. That helped. We were there maybe half an hour early for our appointment. It wasn’t too bad but we did leave ridiculously early for our meeting. The second time I had to go out to the client site, we all drove separately because we all lived far away from each other and it was an early morning meeting. I was almost an hour late. Granted, it was the day after Labor Day and schools had started, but traffic was PARTICULARLY BAD that morning. And I was late. It was harrowing. Oh, also I had gotten sick that morning and so I got to drive all nauseous and headachy. It was THE BEST. The third time I had to out to the client site, we all drove separately again. It was a meeting right after lunch and we were all in different offices. I ended up being an hour early because I was so horrified by my last trip. I prefer to be early than to be late, but an hour early? Really?? And then there was yesterday’s trip. It was an early morning meeting again. There was rush hour traffic. My commute was basically 12938192837928 spot decisions on how to try and avoid being caught in the beginning wave of traffic. When that happens, you just see the wave propagate in front of you and you can never beat it. And the you sit for 3+ hours in traffic trying to get somewhere. That’s what happened the last time I had an early morning meeting at the client site. I was determined not to let it happen again. But at the same time, I was loathe to allot more than three hours travel time. It’s just…so ridiculous when you allot like half a day for travel. One way. Just couldn’t bring myself to do it. Well, I might have to next time. So, here’s the route I took: from startish (which isn’t really where I started because I left from home, but it’s where I start counting mileage), to the 91, to the 5, got off at Norwalk, got back on at Lakewood, to the 101, which I IMMEDIATELY regretted because that was going to take me through DTLA and I have no idea why I got on the 101 to begin with because I knew it would be crowded, got off at Fourth, got back on the 5, to the 2, to the 210, to the 118, to the 23, to the 101, and finally endish. I couldn’t take my normal, more direct route because it involved the 5 and the 101 through DTLA. The 5 is always packed during morning rush hour. The 101 was worse than normal even after DTLA because there was a sigalert at Balboa. I couldn’t take my normal alternate route because it involved the 405. The 605 and 105 freeways were actually not that bad from what I had seen before, but there was an accident on the 405 and thus a sigalert. If I had taken either of those two routes, it would have been a 4-5 hour commute, easy. So I took this weird, stupid, circuitous route and I made it in just under three hours. It was a close call. I got lucky and even managed to go through two speed traps without getting pulled over. I was definitely going at pull overable speeds. Definitely. So definite. So…I will probably have to give myself at least 3.5 hours next time. Four hours would be safer, however loathe I am to do something like that. And it really didn’t help today when my boss came to join me and was all “oh, it only took me about two hours on my bike.” He lives farther away than I do as well. He totally cheats by riding a motorcycle. I don’t care if he complains that someone almost always tries to run him off the road when he’s on his bike. It’s cheating. Anyway, for your viewing pleasure, here is a nicely doodled upon map.